Walt Disney had spent most of his career in animation, refining and improving the medium with each picture. By the 1950's, he had brought it to such a high level of detail that films like Sleeping Beauty were so expensive that they couldn't make a profit. He had also become very busy with other projects, like live action films, television and Disneyland. He was actually advised to get out of the animation business now that he had found success elsewhere. Thankfully, he didn't give up and he took the animation division in a new direction. One Hundred and One Dalmatians is based on a book of the same name by Dodie Smith. Walt personally sought the rights to the book because he thought it would make a fantastic animated feature. This film broke many traditions in Disney animation. For starters, it was the first Disney animated feature to take place in the era in which it was made (late 1950's/early 1960's). While the film contains songs, it's not really a musical. The style of the animation was reminiscent of modern art, which lost a lot of the sleek and refined lines that the studio had been perfecting over the years. Technical advances allowed them to cut time in the Ink & Paint Department by using Xerox technology to scan animator's drawings and print them to celluloid for painting. To create the vehicles in the film, animators filmed model cars and transferred thE film to cels using Xerox, giving them a more realistic look than was possible through hand-drawn animation. There was a designated team that was completely responsible for applying the spots to each dog. Ken Anderson designed the background to look like they had been scanned with Xerox as well to give the whole film a unique style. While the animators were very enthusiastic about the style of the film, Walt was sad to see the refined and polished style of his previous animated films disappear. It took a staff of 300 animators three years to finish One Hundred and One Dalmatians, even with the Xerox process decreasing the amount of time between initial drawings and final cels. The film also cost $4 million to make, which while still expensive was much cheaper than the $6 million it cost to produce Sleeping Beauty. For all of it's breaks in tradition, the film does boast two familiar voices. J. Pat O'Mally voices Jasper and previously voiced Cyril in The Adventures of Ichabod and Mr. Toad and Tweedle Dee/Dum in Alice in Wonderland. Betty Lou Gerson, who voices Cruella De Vil, was the narrator in Cinderella. And the directing team of Woolie Reitherman, Ham Luske and Clyde Geronimi directed some of the greatest Disney animated films up to this point including Pinocchio, Dumbo, Cinderella and Peter Pan. The film opens with a very stylized credit sequence inspired by the spots on the canine protagonists. Roger is a single workaholic songwriter until his dalmatian Pongo forces him to meet a lady named Anita, who un-coincidentally has a dalmatian named Perdita. Roger and Anita/Pongo and Perdita fall in love and get married. When Perdita has a litter of puppies, Anita's fashion crazed boss Cruella De Vil makes a forceful offer to buy the puppies to become part of a fur coat. Roger and Anita refuse, so Cruella has her henchmen Horace and Jasper dognap them. Pongo and Perdita set off on a chase to get their puppies back, getting a whole slew of other animals involved. When they catch up to them, they find that Cruella has had so many other puppies stolen that there are now 99. They are able to outsmart Cruella and return home to Roger and Anita, who decide to keep all 101 dogs (99 + Pongo + Perdita = 101) and move into the country where they can have a "Dalmatian Plantation." One Hundred and One Dalmatians was released on January 25, 1961. It was a hug success both critically and financially. Critics were unanimous in their praise. Some claimed it was Disney's best film since Dumbo. Others applauded the more sophisticated and witty humor vs. the more slapstick gags that Disney was famous for. In terms of financial success, it made $14 million in its initial release, more than 3 times what it cost to make. It reinvigorated and saved an animation studio at risk of being depleted by Walt's other successful ventures. It was rereleased to theaters 4 times in 1969, 1979, 1985 and 1991. It made it's home video debut in 1992. I first saw One Hundred and One Dalmatians during its 1991 theatrical release and I was instantly obsessed with it. While the title card and original promotional material for the film spell out the number, the 1969 rerelase and all subsequent releases have shortented it to the numerical spelling, 101 Dalmatians. The film is delightful and instantly appealing to all age groups. Look for cameos from some of the dogs from Lady and the Tramp, including Lady, Jock, Bull and Peg. Disney animation fans might also catch the puppies watching the famous Disney short, Flowers and Trees. The film was adapted into a successful live action film in 1996, starring Glen Close. A short lived animated series was made in 1998 and a live action sequel, 102 Dalmatians, followed in 2000. In 2003, Disney made a direct-to-video animated sequel, 101 Dalmatians 2: Patch's London Adventure. While it has spawned an impressive amount of content in recent years, none of it lives up to the original 1961 classic. 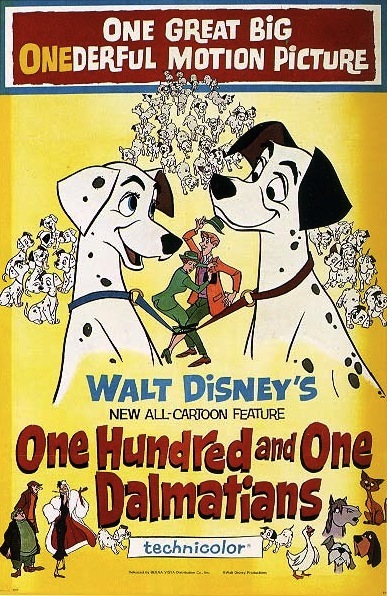 One Hundred and One Dalmatians is scheduled to be released on Blu-Ray as a Diamond Edition on February 10th, 2015. It was last released on DVD in 2008 as a 2-disc Platinum Edition, which has been out of print since January 2010. The film has received a full restoration and looks spectacular. The film is presented in fullscreen, which is actually it's original theatrical aspect ratio. While surprising for an era where widescreen was the norm and a selling point to get viewers away from their TV sets, shooting in fullscreen saved both time and money. Bonus features on the DVD include a behind the scenes feature, a piece about Walt Disney's relationship with Doddie Smith, animation galleries, deleted songs and a pop-up trivia track. It is expected to be released again in 2014 as a Diamond Edition.